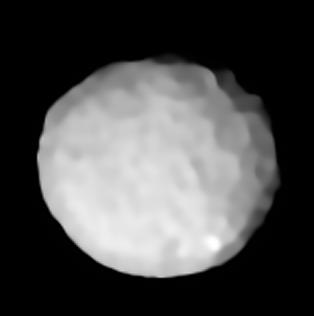 Vesta is one of the largest objects in the asteroid belt, with a mean diameter of 525 kilometres (326 mi). 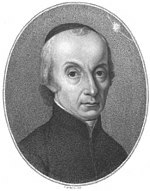 It was discovered by the German astronomer Heinrich Wilhelm Olbers on 29 March 1807 and is named after Vesta, the virgin goddess of home and hearth from Roman mythology. Pallas is the second asteroid to have been discovered, and is one of the largest asteroids in the Solar System. 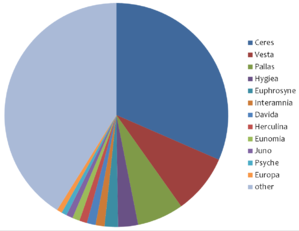 With an estimated 7% of the mass of the asteroid belt, it is the third-most-massive asteroid, being 10–30% less massive than Vesta. It is 512 kilometers (318 mi) in diameter, somewhat smaller than 4 Vesta. It is likely a remnant protoplanet. A protoplanet is a large planetary embryo that originated within a protoplanetary disc and has undergone internal melting to produce a differentiated interior. Protoplanets are thought to form out of kilometer-sized planetesimals that gravitationally perturb each other's orbits and collide, gradually coalescing into the dominant planets. Hygiea is a major asteroid located in the main asteroid belt. With somewhat oblong diameters of 350–500 kilometres (220–310 mi) and a mass estimated to be 2.9% of the total mass of the belt, is the fourth-largest asteroid in the Solar System by both volume and mass. 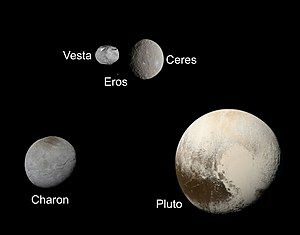 In some spectral classifications it is the largest of the dark C-type asteroids with a carbonaceous surface, in others it is second after 1 Ceres. 7604 Kridsadaporn, provisional designation 1995 QY2, is an unusual, carbonaceous asteroid and Mars-crosser on a highly eccentric orbit from the outer regions of the asteroid belt, approximately 12 kilometers (7.5 miles) in diameter. It was discovered on 31 August 1995, by Australian astronomer Robert McNaught at Siding Spring Observatory near Coonabarabran, Australia. 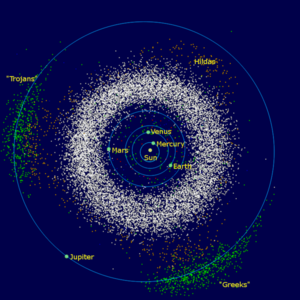 Due to its particular orbit, the C-type asteroid belongs to MPC's list of "other" unusual objects, and has been classified as an "asteroid in cometary orbit", or ACO. The asteroid was named in memory of Thai astronomer Kridsadaporn Ritsmitchai. A minor planet is an astronomical object in direct orbit around the Sun that is neither a planet nor exclusively classified as a comet. Before 2006 the International Astronomical Union (IAU) officially used the term minor planet, but during that year's meeting it reclassified minor planets and comets into dwarf planets and small Solar System bodies (SSSBs). 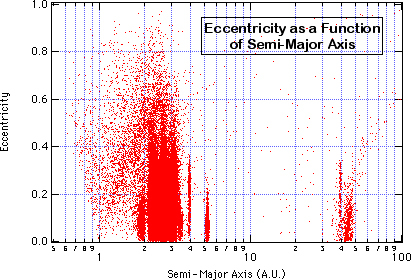 The Nice model is a scenario for the dynamical evolution of the Solar System. It is named for the location of the Observatoire de la Côte d'Azur, where it was initially developed, in 2005 in Nice, France. 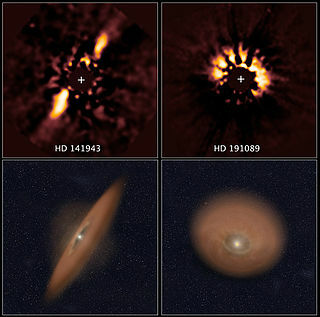 It proposes the migration of the giant planets from an initial compact configuration into their present positions, long after the dissipation of the initial protoplanetary disk. 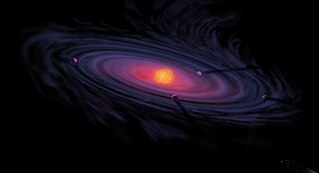 In this way, it differs from earlier models of the Solar System's formation. 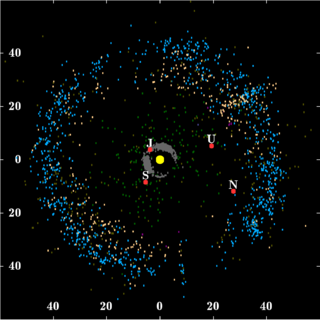 This planetary migration is used in dynamical simulations of the Solar System to explain historical events including the Late Heavy Bombardment of the inner Solar System, the formation of the Oort cloud, and the existence of populations of small Solar System bodies including the Kuiper belt, the Neptune and Jupiter trojans, and the numerous resonant trans-Neptunian objects dominated by Neptune. 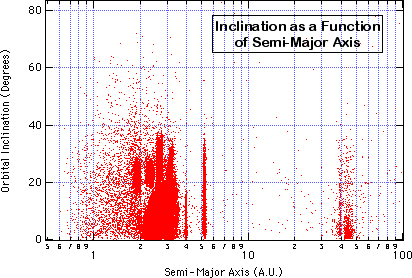 Its success at reproducing many of the observed features of the Solar System means that it is widely accepted as the current most realistic model of the Solar System's early evolution, although it is not universally favoured among planetary scientists. 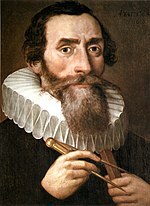 Later research revealed a number of differences between the original Nice model's predictions and observations of the current Solar System, for example the orbits of the terrestrial planets and the asteroids, leading to its modification.